Venice Carnevale is the period before the start of Lent, ending on what Americans know as Mardi Gras or Fat Tuesday. Different versions of Carnevale take place all over the world. The festival in Italy is popular for its celebrations and elaborate masks. Celebrate Carnevale in Italy with masquerade balls, parades, fireworks, and entertainment. One thing you must do is buy a mask and join in on the festivities. 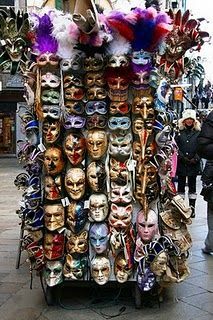 The masks are the biggest tradition in regards to Venice Carnevale and you can buy ones ranging from cheap, simple masks to elaborate and expensive ones. It is an event not to be missed if you have the opportunity to go. Come along with FlorenceforFun to Carnevale this season!